The Florida Climate Center's June 2016 Florida Climate Summary is now available. The summary provides an analysis of temperature and precipitation patterns during the past month across the state, along with data on hazardous weather, drought, the impacts of the weather, and any records tied or broken for the month. During June, temperatures averaged well above normal, and rainfall totals were varied across Florida. With ENSO-neutral conditions in place currently, sea-surface temperatures continued to cool last month in the equatorial Pacific, which is a harbinger of possible La Ni ña conditions by fall. (More later in the newsletter.) The Climate Prediction Center (CPC) predicts above-normal temperatures and precipitation for the state through September 2016. Past summaries are archived here. The following table gives June average temperatures and departures from normal (˚F) for selected cities. The following table gives June precipitation totals and departures from normal (inches) for selected cities. 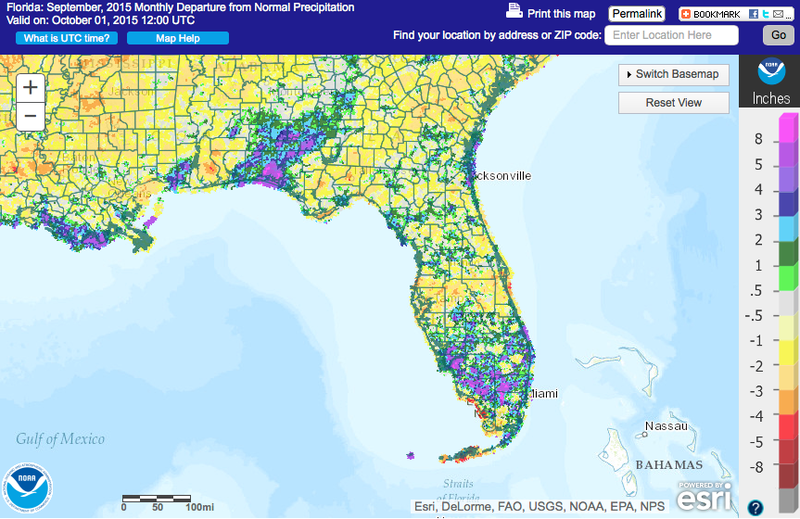 The following schematic maps June precipitation departures from normal across Florida. Image courtesy of the Midwestern Regional Climate Center's cli-MATE application. Last month, a new staff member joined the Florida Climate Center, taking over for Melissa Griffin, who left the staff last October after over a decade of service. Danny Brouillette, pictured left, arrived from State College, Pennsylvania, where was graduated from Penn State University last year with a master's degree in meteorology. At Penn State, he studied under the advisement of Dr. Michael E. Mann, working on a project that sought to produce proxy-based reconstructions of hydroclimate over mid-latitude North America over the last 2000 years. Before attending graduate school, Mr. Brouillette completed a bachelor's degree in meteorology in 2012 at Northern Illinois University, near where he was born and raised. At Northern Illinois, he worked under the direction of Dr. Dave Changnon on research involving various facets of Midwestern regional climate variability. Although all weather and climate phenomena interest him, snow is his favorite of them all (and Florida has scant little of it!). Mr. Brouillette looks forward to contributing to the full range of service, research, and outreach efforts of the Center. 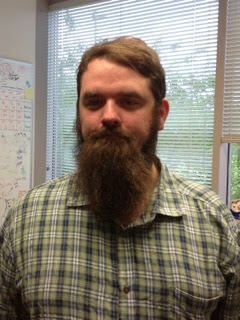 His e-mail address at the office is dbrouillette@coaps.fsu.edu; his phone number there is 850-644-0719. After a strong El Niño episode this past fall and winter, sea-surface temperatures in the equatorial Pacific Ocean have been cooling in the last few months. Sustained cooling of waters in this oceanic region is a hallmark of the negative phase of the El Niño-Southern Oscillation (ENSO), known as La Niña. NOAA's Climate Prediction Center recently released an analysis whose conclusion is that a La Niña episode may possibly take shape by fall and continue through the winter. The CPC this month updated its La Niña Watch, which indicates a 55-60% chance of La Niña formation. According to the CPC, the most likely scenario is a weak episode. State Climatologist David Zierden attended the 41st annual meeting of the American Association of State Climatologists (AASC) on 28 June through 1 July at Santa Fe, New Mexico. The AASC is a professional organization that includes all of the State Climatologists, Regional Climate Center directors, partners at NOAA NCEI, NWS, and NRCS, and many associate members associated with each of these groups. The meeting was hosted by the New Mexico State Climate Center at the historic La Fonda resort on the plaza of historic Santa Fe. During the meeting, sessions were held on weather and climate extremes, mesonets and regional climate services, along with the association's business meeting. In the business meeting, Mr. Zierden was re-elected as the AASC treasurer for another two-year stint. In the photo above are all the state climatologists in attendance at the meeting.